It has been so good to be back in PNG. As we were so busy traveling around the USA it was wonderful to see so many people that I had not seen for a long time. We were home for a year and it was easy to get used to life in America. I was beginning to wonder how ready I would be to return to life in PNG. Just a few days after returning I threw myself right into translation work. As I worked with the Notsi translators we were able to finish the first draft of the New Testament. That is a small milestone, but very encouraging to the translators. There is so much more work that needs to be done. It has been a great joy to be back. We have a new member on the translation team, Lynnette. She has been so excited to be involved in Bible translation and has been a wonderful addition. Our first Sunday of the New Year, Gertrude and I spent a Lossu. Emmanuel Church. I printed out copies of some of the hymns that were translated for the morning service. Everyone seemed so pleased to sing these hymns in their own language. Their favorite being, I am so Glad that Jesus Loves Me. Following the hymns they read from the Gospel of John in Notsi. We were so blessed to hear them reading their own language during the service. Most times only Tok Pisin (the national trade language) and English is used. 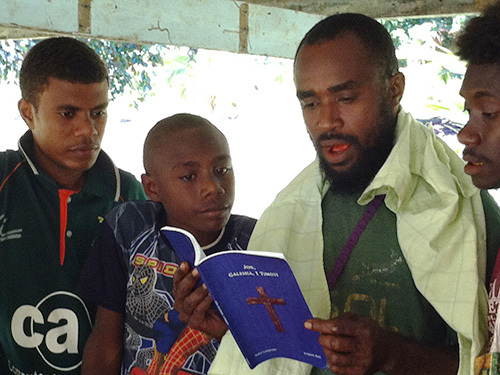 Pray with us that more people will coming along side to help in translation and in the distribution of the Scriptures. Also that people will be open to Word so the Holy Spirit can work change in their lives. As 2015 came to a close, I realized that God had been answering some really specific prayers for Kevin, me and and our ministry with Wycliffe. While in the USA, I re-learned the art of diligent study in order to succeed academically. I was reminded of 2 Peter 3:14 (NASV) —”Therefore, beloved, since you look for these things, be diligent to be found by Him in peace, spotless and blameless.” I found myself experiencing God while taking Research Methods and Statistics courses! I was reminded that just as I must study diligently to succeed in these, I must be diligent to to live in peace, spotless and blameless in my spiritual walk. I gained a renewed sense of dependence on God in the learning process. When the courses were done Kevin and I changed gears and began travel through parts of the northeastern USA and southeastern Canada. It was late Spring and seing God’s handiwork in the beauty and power of Niagara Falls and resting in Him. We simply enjoyed the love and fellowship of family and friends. We met new friends as we went about telling of our mission experiences and experiencing the Love of God among supporting churches. As we returned to Papua New Guinea I began a new role at the SIL PNG headquarters, so we were separated again only to experience God’s sustaining grace as we lived apart for the sake of the Gospel. I think the most painful experience was losing my pastor and friend of a lifetime in October. Dr. Eddie B. Lane showed so many how to live for Christ and now he has shown us how to finish well. We rejoice to have his wife continuing to serve the Lord with Bibleway Church in Dallas. Reuniting with the Notsi in November was a definite highlight and especially so, after I suffered an infection in December. Even in that we experienced to love of the Notsi toward us and we witnessed the grace of God in medical care. I was especially blessed by exceptional TLC Kevin provided to speed my recovery! We closed 2015 with firm assurance that God is in control of all things. Of course, these few lines could not express the great love we experienced as we walked with the Lord through 2015 but we hope they give you a glimpse of God’s goodness. On October 26, 2014 Gertrude and I visited the Post Oak CME Church. The church is less than a mile from Gertrude’s family home. When Gertrude was a child she remembers visiting the church on occasions when they had revivals or other special events. We were given a very warm welcome. The pastor, Rev. Mays, first learned of us from Bishop Bishop Reddick. He was very pleased to have us there to visit. He invited us to share with the church about our work in Papua New Guinea. He and others from the church were full of questions questions. We enjoyed our time with them. As this church is in a small town where Gertrude grew up, she met many people that she knew even family. One of her elementary school teaches who had been a real encouragement to her was there. We look forward to visiting there again in the future. Sunday morning I decided that I would go and visit a couple of churches in the Notsi language area to encourage the use of the new Scripture portions that we dedicated in July 2014. As I was on the road I asked the Lord to guide my steps that I would be able to see those I wanted to see. My first stop was to the Amba United Church. I arrived towards the end of the service. I was given a few minutes to share what was on my heart. I show the church the book that we published with the Gospel of John, Galatians and 1 Timothy. I encouraged everyone to buy a copy. If they did not have the money with them now they could buy it from the translators. I also shared with them how we need their help to finish the editing of the Gospel of Luke. One of the translators would be coming to work with them this week. Afterwards I was visiting with different people and giving them an opportunity to read from John. The only Bible they have to read from is the English or the Tok Pisin (the national trade language). One lady said that it is hard for them to read from the Notsi scriptures because they are not use to reading their own language. It is easier for them to read the Tok Pisin or the English because that is what the used in school. The problem though is that they can read the other languages but they have trouble truly understanding what they are reading. When they read the Notsi the meaning is very clear because it is the language that reaches their heart. As I continued my travels I was pleased that there were programs going on after services in different villages that I visited. So instead of just visiting two churches I as I thought I would I was able to visit 4 different churches and share with everyone about the Notsi Scriptures being available. I was able to sell three more books. Two of them were to old ladies, that really valued their language and were pleased to have a copy of the Scripture portions. Please pray that we will be able to sell all 200 copies of the book and that the Notsi people would read it and allow the Lord to change their lives through the reading of His Word. When we were not traveling Gertrude was spending time to care for her mother in Longview. I spent my time taking a couple of classes related to Bible translation at the Graduate Institute of Applied Linguistics. We rejoice that as we were ready to depart PNG for the funds that we needed to return to had been pledged. Right after I finished classes at GIAL we rented a car and drove to Albany, NY. We were able to spend 10 days in the area visiting churches and friends that have been supporting us over the years. It was so good to see so many, but was sorry that we were not able to catch up with everyone that we wanted to. On the way back stopped in New York City to visit my brother and sister that we have not seen in a few years. As I was with my brother, Mark, we went to visit one of our cousin, Tony Blair, that I haven’t seen in over 20 years. It was a fun reunion. He had just gotten home from work and so at 11:30 PM we are arriving at his door. He did not want to miss the opportunity to see us. It was about 1:00 AM as we were starting back to Mark’s house. From NYC we continued on to Virginia to visit my parents who we saw on our way to New York as well. July we just finished a very full and busy eight months in the U.S.A. It seems that when ever possible we were traveling one place or another. November we arrived in Dallas from our short vacation in Australia. After just three days we were on our way to Orlando to visit at the Wycliffe USA office. It was so good to see friends that after so many years. We rented a car to visit Gertrude’s sister in Tampa. We then flew up to Virginia to visit my family for Thanksgiving. During our time there we rented a car to visit supports driving from Virginia Beach up to Philadelphia. This was just a little taste of what our time home would be like. While we were back to Dallas nearly every weekend we were on the road to visit different churches. As you look at the map you get an idea of all the places we went: Kansas City, MO (B), Baton Rouge, LA (D), Birmingham, AL (F), Austin, TX (H). On Easter Weekend we went from Longview, TX (J) to Houston, TX (K) then San Antonio, TX (L) then back to Dallas, TX. At each of the churches we visited we were given a warm welcome and opportunity to share what the Lord is doing in our ministry here in PNG.